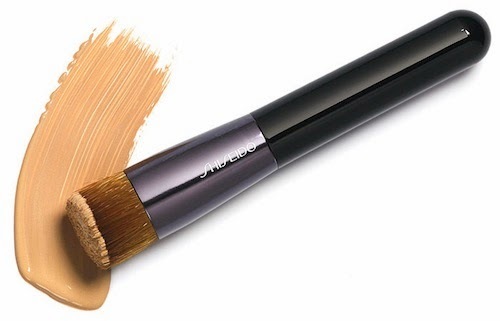 Shiseido Perfect Foundation Brush - $35 - a versatile foundation brush for use with all formulations - liquid, cream or powder, this brush picks up all types of formulas for a uniform application and impeccable finish. The only thing they recommend you don't use it for is water resistant foundation. Gently tapered strands create an angled slant that best allows bristles to reach all facial contours. A short handle allows for precise control during application and portability for travel. It also offers options for coverage: if you want light coverage, apply the foundation in long strokes; for heavier coverage, use dabbing motions to press the foundation into the skin press/dab the brush on the desired area and don't stroke to blend it in. The best thing about brush though is how soft it is, it's like applying your foundation with a soft little bunny rabbit - and before you freak out, it's a synthetic bunny rabbit! Just remember, if you want it to keep it's softness you need to wash it often with a mild cleanser. This looks like a great find! Can't wait to try it - thanks!